What is Kombucha? Is it Good For You? What is Kombucha? I have been asked about this drink and I had to go figure it out. 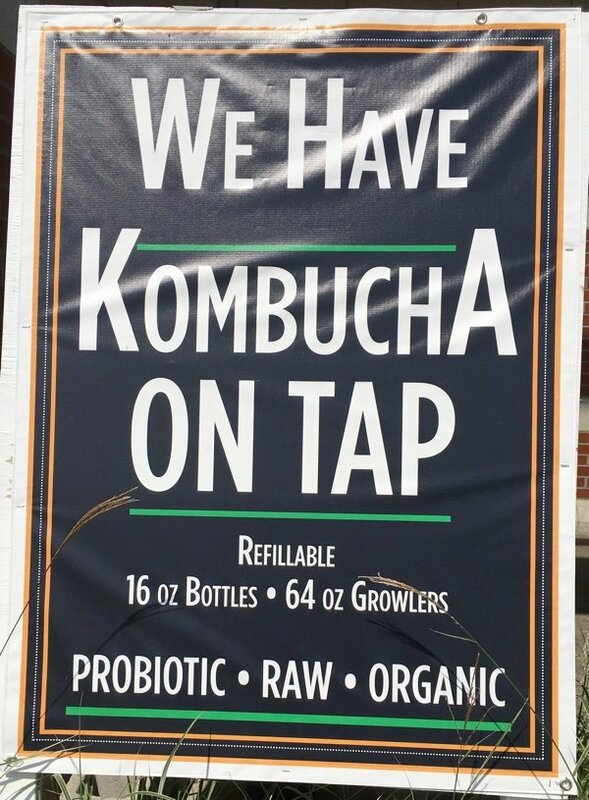 I knew that Kombucha was a big deal when I saw this sign outside of my favorite supermarket – which is not Whole Foods (in case you were wondering). I can’t afford to go to Whole Foods for my weekly shopping. On tap? Are you kidding me? Since I didn’t even know what it was, it was clear that I was (once again) in the dark about a new health product. Kombucha is a fermented beverage of either black or green tea and sugar. It is considered a “functional food” because it may have a positive effect on health beyond basic nutrition. Since it is served raw, the bacteria and yeast that are in the drink are alive when consumed so it can be helpful for digestion. Many foods have good bacteria in them for healthy digestion (think yogurt). Kombucha is high in acid, B vitamins, and antioxidants (from the tea). 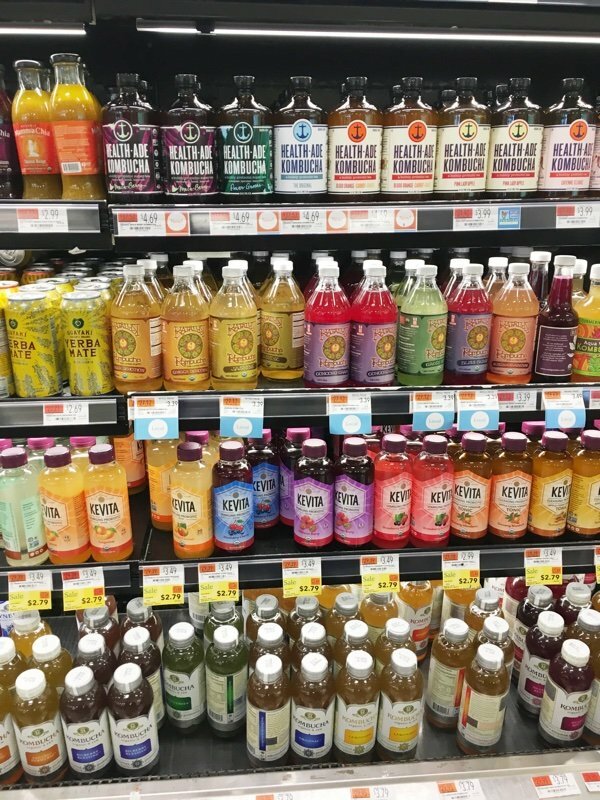 You can find all sorts of kombucha in a place like Whole Foods (where I took this photo) and the flavors include mojito, ginger, and blueberry. When I wrote Is Orange Juice Healthy?, I talked a lot about sugar because this is my main concern with drinks. These kombucha drinks vary enormously in the amount of sugar that they have added to them. You really need to look before you buy. The ginger Kevita Master Brew Kombucha in the top photo had 15 grams of sugar and 80 mg of caffeine. It said it was “naturally energizing” – yeah, 80 mg of caffeine is going to energize me! Obviously, this is not a good choice from the display. I was absolutely fascinated by the taps in my supermarket and couldn't wait to play with them. For a large drink, this is very low in sugar so I was excited to try it. The taps had little cups so I could sample all of the flavors (woohoo!). I liked all of them. They are a little sour and very bubbly. The ginger flavor was my favorite. Guess what fermented drink this reminds me of? Beer! 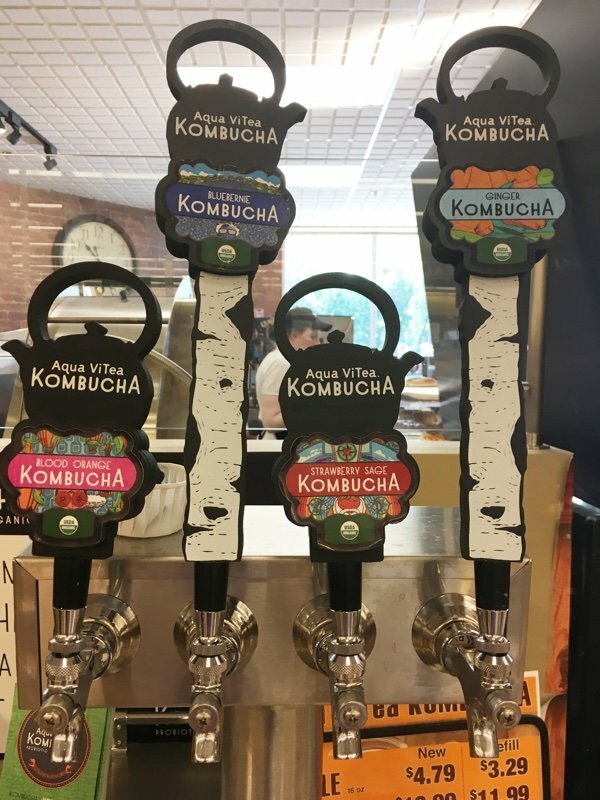 For all those beer drinkers out there that are looking to cut back, kombucha might be a good choice. I liked the flavor and the lack of calories. What I didn’t like was the cost (over $3 for 16 ounces) and the variation in the brands. I can’t tell you if the drink has health benefits or not because there don’t seem to be many scientific studies out there on its advantages. One thing is that if you drink this instead of soda, you are making a much healthier choice as kombucha has far less sugar. I don’t see any reason why it would be bad for you – so why not try it? 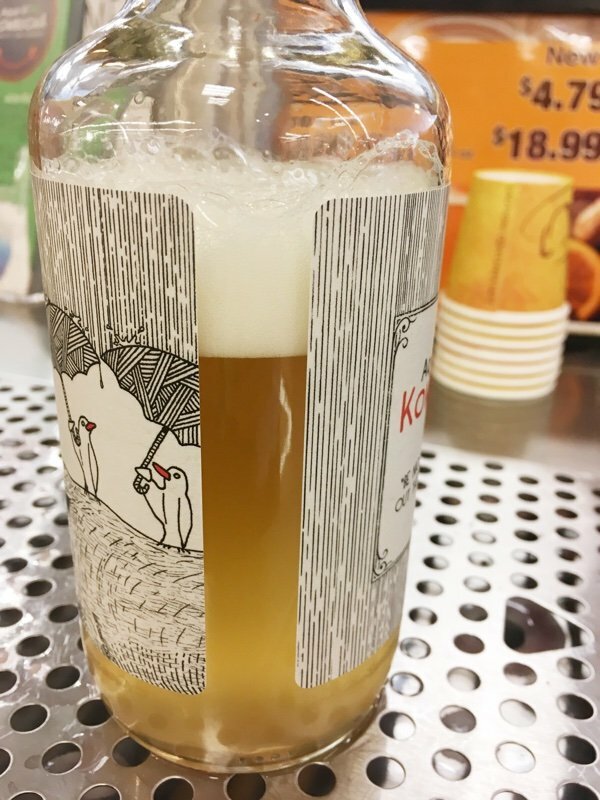 Have you tried kombucha? What did you think? A tall glass of orange juice is hard to resist but is it healthy? I make my own at home. It's a lot of fun and kombucha is very versatile. I will be trying lavender kombucha today and I can hardly wait to chill it. I agree ginger is an excellent flavor. Kombucha is not new at all. They only add sugar to make it more attractive to the people. When you make it yourself you don't add sugar to it when it's finished. Please look at www.culturedforlife.com and you can read all about it. You won't regret it. That's a promise. Well Lisa, talk about what you know.. Or research it first! Doesn't good bacteria for your gut sounds good? And there are studies in kombucha for god's sake! And plenty of people who talk about it. Why do you post something if you have no idea?? Lisa, keep up the good work on your findings. Luisa, she was honest about her inquiry, Kombucha is something new around here where I live and knew nothing about it.. So she did her job and researched it for us.. I agree, Annie,why slam someone when they preface their blog by saying they haven't researched it extensively. Easy up Louisa. It is interesting that snack girl lives in a demographic where kombucha is a new craze. In Portland, Oregon people have been brewing and drinking it for at least 20 years. Course we are pretty famous for our microbrews too. I love kombucha and drink it all the time. I don't drink soda or alcohol so this is a real treat for me. I don't typically drink a whole bottle of it at once so the cost isn't disturbing to me. Not new around here either. It's been around for years even in my relatively small city. I would love it if my store sold it that way. Thanks for the post. Yes not everyone is familiar with Kombucha. I am also familiar with kombucha and have brewed my own. I tend to like the ginger flavors best. I do notice a difference in my digestion when I drink it. dairy doesn't sit well with me, I like that I can get probiotics in with kombucha. This is a love it or hate it beverage. I find kombucha very refreshing over ice on a hot summer day. My stomach loves it too. I live midway between Philadelphia and Atlantic City -- hardly the boondocks -- and I first heard of kombucha only 3 or 4 weeks ago. I appreciate this post and the basic info as it's presented. Kombucha is not new. I have have made my own since at least 25 years ago when I started. I never had to add sugar to mine after it is brewed. It is delicious and easy to produce and very little work to keep it going. Many of the health benefits are not immediately apparent for most but I found it helpful in the long term. You are right. Was a typo 😁. I discovered Donna 6 months ago and am so happy I did. Btw I live in NS Canada. I've been brewing my own kombucha for about a month now and absolutely love it. It's just sweet tea that you ferment with a SCOBY. I got my first SCOBY at the food co-op in Fort Wayne, IN and have been brewing ever since. Be careful when you first start drinking it. It can start detoxifying your body with some gas/nausea/diarrhea. Start small and work your way up. You won't be sorry. My homeopathic doc suggested I drink this over a year ago for its health benefits. I drink at least 8oz every day and usually brew it myself. Strawberry lemonade is my fav homemade flavor. I literally never get sick since I started drinking this power drink! I do agree that some of the store brands have unnessary added sugar. It is an acquired taste for some as my daughter says it tastes like vinegar but I find it delicious! I like it but I have to be careful to avoid ones with Stevia (it lowers my blood pressure too much). 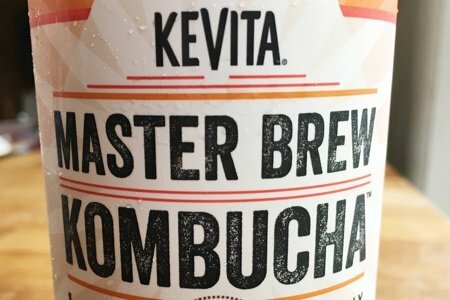 True kombucha does not have Stevia in it anyway. Fermented foods have many health benefits from what I've read. First off, I have heard of Kombucha but have not tried it. Anything with the word fermented in it is a big NO for me. Just my personal preference lol! Second, jeez Luisa, no reason to attack like that when Lisa said she had just heard of it. At least be respectful if you have something to say.